Sri Raj Rajeshwari temple doesn’t ring much to an average resident of Jaipur even though it’s a heritage temple commissioned by the erstwhile ruler of Jaipur state, Maharajah Sawai Pratap Singh. Sri Raj Rajeshwari temple, Jaipur has a high fortification wall running all around its perimeter. Dedicated to Mata Raj Rajeshwari, this temple is supposedly built using “Tantra and Mantra” meaning idol has mystic & spiritual powers. There is a very interesting incident associated with this temple, as narrated by the caretaker of the temple. Before construction of Sri Raj Rajeshwari temple, this area belonged to Shri Amritpuri Maharaj and area was called Amritpuri ka Chippa. An Akahada (arena) of Naga Sadhus, was organized here. 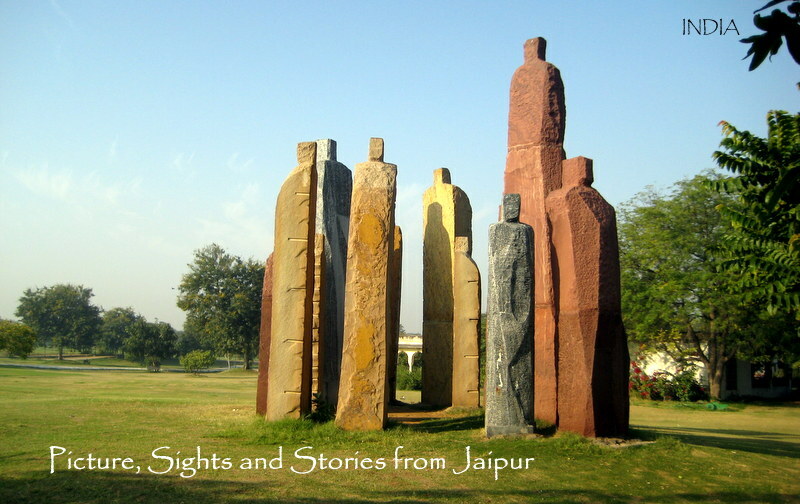 During the reign of Maharajah Sawai Pratap Singh, Maratha army attacked Jaipur. Maratha and Jaipur army fought at Tunga, near Jaipur. Marathas heavily pounded on Jaipur which caused Maharajah Sawai Pratap Singh to anguish. Worried, he sought help & blessing from Shri Amritpuri Maharaj to turn the tide against the Marathas. Shri Amritpuri Maharaj gave his blessings to the king but with a rider that upon winning the war against Marathas, he would construct a temple dedicated to Mata Raj Rajeshwari. He happily agreed. With the turn of events, Marathas retreated and as promised the king built this temple. The temple follows a non-ostentatious Rajput architectural style. A high boundary wall in a fortification style protects the temple. All Haveli style temples in Jaipur exude a feeling of palace and openness, Sri Raj Rajeshwari temple is no different. The sanctum and Jagmohan (prayer hall) of the temple are built on a high plinth, in line with other temples commissioned during Maharajah Sawai Pratap Singh’s reign. This temple is famous for its Tantric & mystic abilities. Devotees visit Sri Raj Rajeshwari temple to seek blessings to overcome their problems. In that sense, it’s no ordinary temple. The upkeep of the temple is great, in spite of being more than 200 years old. There have been some renovations in the temple during the last few years which don’t go well with the heritage look of temple architecture. The caretaker explained that they wanted these restorations to take place in old techniques, but non-availability of skilled workforce has forced to use newer methods. Therefore cement is used instead of lime mortar. The temple is maintained by a priest family and claims that the temple was handed over to their lineage by the Royal court of Jaipur. They derive no funding from the government to maintain this temple. Photography is not permitted inside the sanctum of the temple. During the old day and much before the piped water line, availability & storage of water was important for the sustenance, hence a Baori was built near the temple to ensure availability of water. Entrance to Sri Raj Rajeshwari temple, Jaipur. Lion sculpted out of stones on either side of the gate is a signature style found in all temples built by Maharajah Sawai Pratap Singh. Click here to read about other temples commissioned byMaharajah Sawai Pratap Singh. Sylvan surrounding adds to the serenity of Sri Raj Rajeshwari temple. Even though the temple is not ornate, the peace and tranquillity of vicinity is certainly a big draw. And the best thing is that you don’t have to take a leave to explore around! Such a lovely temple.The photos convey the divine peace that prevails within.Thank you! Yes, the entire place is so peaceful…away from the hustle bustle one usually comes across in the city! sort of get away! Thanks for liking and commenting. Thank you for your visiting and leaving your kind comments. I like your header, love the stone wall and its natural surrounding. Have a great new week! I love the black and white pictures, Arv. The reason for choosing black and white is that I feel it relates to heritage and history better. Thank you xhobdo! Yes, I love monochrome pictures… timeless ! Previous Previous post: Friday Skywatch -Sunrise/ Vivid Sky!